The dishes with the most familial history have always been, for me, the most daunting. Because of this, I avoided making traditional Italian meatballs for years. There is no dish, in my family at least, more revered and more universally appealing to a wide audience. As most Italian Americans will tell you, their grandmothers' made them best, and the same is of course true for my Neapolitan grandma. After her passing, my mother and I tried in earnest to recreate her fantastic meatball recipe - but first we had to find it. This meant scouring her files and recipe boxes for her handwritten index cards and little papers shoved into issues of Gourmet Magazine decades old. Once obtained, we'd be routinely perplexed at the fact that no matter what we did or how carefully we followed along, the result was always just a smidgeon less delicious than my grandma's. My mother has always been a superb cook, and with some time, she got her meatballs to a place we could all be proud of. When I came of age and was finally inclined (or brave enough) to try my hand at grandma's recipe solo, the pressure was really on. The card, written in her beautiful, curly penmanship, looked simple enough, but to my dismay, included several phrases that were up for interpretation like: "a scant cup of freshly grated pecorino." Now I know that a scant cup means just shy of a cup, but how shy??" Such uncertainties really invite neuroses, if you ask me. It wasn't until my mom and I became aware of the Rao's Cookbook, that our meatball recipe quest officially came to an end. Their recipe is nearly identical to my grandmother's method with two exceptions - she would use chunkier pieces of homemade breadcrumbs soaked in milk, and she'd omit one cup of water. The Rao's recipe offered me clearer direction than her index card, which of course I still use and treasure, and it took away some of the guess work by laying out the method in a clearer fashion. It has since become, to my mind, the best iteration of traditional Italian-style meatballs out there... and I can live with that, because they are so similar to my Mima's! Flat flavor - A lot of meatballs are tasty but not complex. They hit one flavor note. Overly firm and dry meatballs - The outside of a meatball is a key area. When it is firm, dry, or rubbery, the meatball is ruined. Adding enough liquid to the meat mixture is necessary to achieving the ideal texture. The quest for the perfect spherical shape is an exercise in folly - When a meatball comes out perfectly round, be warned. Any meatball worked that hard is likely to be sub-par. Check out my theory next time you spy a super-round meatball. Do not overwork the meat - I cannot stress this enough. Handle meatballs with the lightest touch possible as you form them. Please, for me. Use a combination of meats - The best meatballs, my grandma's, Rao's, are made of more than just beef. The veal and the pork combination with the beef is absolutely key to the flavor complexity, and imparts a buttery richness to the flavor without adding any heaviness. The meats also have varying fat contents that aid in preserving the moisture needed for the perfect ball. Method - Cooking method is one of the big reasons some meatballs come out too firm on the outside. 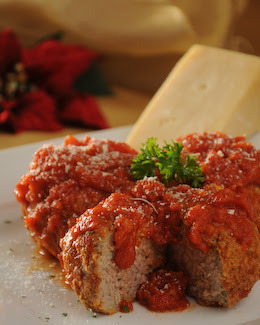 I have never had a baked meatball I enjoyed as much as the fried version. The texture comes out totally different, and not for the better. Now taste and texture preferences are clearly subjective, but please, give yourself a chance to experience a fried Italian meatball. After all, the people at Rao's agree! You'll never go back to baking. Now frying does add a bit of extra time and effort, but it's time well spent. The key to frying a great meatball includes draining them well on paper towel, and ever so slightly undercooking them. You can freeze them in this state if you wish, and thaw them when ready to eat by dropping them in tomato sauce and warming them through slowly, so they are thawed and cooked completely. The perfect meatballs will just never be round - If your meatball is perfectly spherical, it runs the risk of being dry and overworked. As well, the moisture needed for a good meatball will simply not allow it to preserve its round shape during cooking - especially if you are frying them. If it does, the recipe is probably too dry. Baked meatballs make for a rounder result but when you fry them, a good recipe will usually end up looking like round spheres with flat tops and bottoms. For me, this is sign of a great meatball, and the natural result of frying gently on each side. Learn to love this quirky shape, and the taste will be a huge payoff. When you cut into your meatball, it should yield easily to your fork, even break into pieces a bit on your pasta. This is a good thing! Embrace it. The secret's in the water. Two cups of water seems a lot, but that is precisely what keeps these meatballs so tender and juicy. The ratio of the three meats is well balanced. You'll get a complex hit of meatiness, fragrance from the herbs and garlic, and a bit of tangy flavor from the cheese. Note: as with all meatballs, they get tastier the longer they sit in your fridge. Blend bread crumbs into meat mixture. Slowly add water,1 cup at a time, until the mixture is quite moist. Shape the meat mixture into balls (2½ to 3 inch balls). Heat olive oil in a large sauté pan. When oil is very hot but not smoking, fry meatballs in batches. When bottom half of meatball is very brown and slightly crisp turn and cook top half. Remove from heat and drain on paper towels.